Aveeno Daily Moisturizing Lotion Review-The best lotion for dry skin! Aveeno Daily Moisturizing Lotion...It's great for dry skin! I have combination skin on my face, but dry and sensitive skin everywhere else. My dermatologist recommended Aveeno lotion. My skin gets worse during the fall/winter months, when my hands are so dry, they crack and bleed (ugh!). Just one use, and my skin doesn't feel dry anymore. I can see and feel improvement in just one day. I use it all over--especially on hands, arms, legs and feet. This is truly the best lotion for dry skin I have ever found! Fragrance free, non-greasy, non-comedogenic, natural oatmeal product that helps soothe and moisturize dry, itchy, extra dry skin. 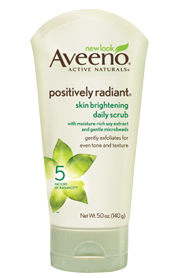 Aveeno Positively Radiant Skin Brightening Daily Scrub-brightens your skin! Dull, dry skin doesn't stand a chance against Aveeno's positively radiant daily scrub. I've always had skin issues since I was a teen, it has always been a battle with acne, then adult acne. As I've gotten older, I now have been blessed with sensitive skin, rosacea, and other issues that are common as we age. (Sigh!) My dermatologist recommended Aveeno products. I've been using Aveeno's daily moisturizing lotion (giant bottle at Costco, see my review on previous post) and it has done wonders for my skin! So...I decided to try Aveeno's daily scrub. Soy extract, with round microbeads...it's soap free, oil-free, hypoallergenic, and contains Vitamin E. It's sensitive enough to use daily, but I usually use 2-3x/week or so as needed. I really feel like my skin is smoother, brighter, and more radiant! Could drug store make up really be as good as the ones in department stores? 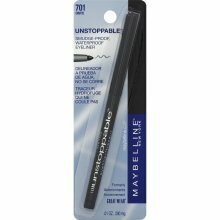 I've always been a MAC user, but I decided to try Revlon's eyeliner, and liked it...so when I saw Maybelline's Unstoppable Eyeliner on sale at CVS--well, I had to give it a try too. I have to say, I was surprised how far drug store make up has come! It really is "unstoppable" too. It stays on without smudging, until I take it off. Love that! Regular priced at $7.39 at CVS, (cheaper at WalMart), and on sale for under $5 plus change--what a deal! These are Hawaii prices, so for those of you living elsewhere, it will be even cheaper for you. Lucky you! Safe for sensitive eyes. Contact lens safe. Ophthalmologist-tested. Stays put all day; holds your look in place until you remove it. Glides on smoothly; easily lines and defines eyes. Self-sharpening; swivels up and down so point stays sharp. Comes in a variety of colors. Made in USA.